In the first two installments of “Introduction to Psychrometrics” I covered concepts such as air, evaporation, temperature, condensation and dew point. I strongly encourage you to read Part 1 and Part 2 before reading this final installment where I’ll be explaining relative humidity, humidity ratio and a few other concepts. The amount of humidity in the air will affect the indoor air quality, therefore it is important to measure it. Unfortunately, there are four common terms used to quantify humidity: relative humidity, humidity ratio, absolute humidity, and specific humidity. I’ll cover all four concepts in this post. As a quick refresher, humidity is a measure of the water molecules in the air that have escaped the surface of liquid water. I’ll be using the term “water vapor” to describe these molecules. Water vapor is the result of evaporation (see the word “vapor” hidden in there?). Relative humidity, or “RH”, is the most commonly used expression for humidity. It also happens to be the least understood. Relative humidity is the ratio of water vapor in the air compared to fully saturated air at the same temperature. In other words, there is a certain amount of kinetic energy in a system to free water molecules. RH looks at how much of the system’s kinetic energy has been used to free molecules. When I use the term “system” I am referring to the air + any liquid water that may be present. If a room has a relative humidity of 40%, it still has a lot of unused energy (60%). Put a cold glass of water in that room and the kinetic energy in all gas molecules (nitrogen, oxygen, water vapor etc.) will transfer heat to the cold water. When the water molecules heat up, that increases their kinetic energy and ability to escape the liquid surface. If we increase the temperature of the system, we are increasing the kinetic energy. Warmer air + water can free up more molecules with that extra kinetic energy. Colder air + water has less kinetic energy and therefore can free up fewer water molecules. Relative humidity is therefore relative to temperature. 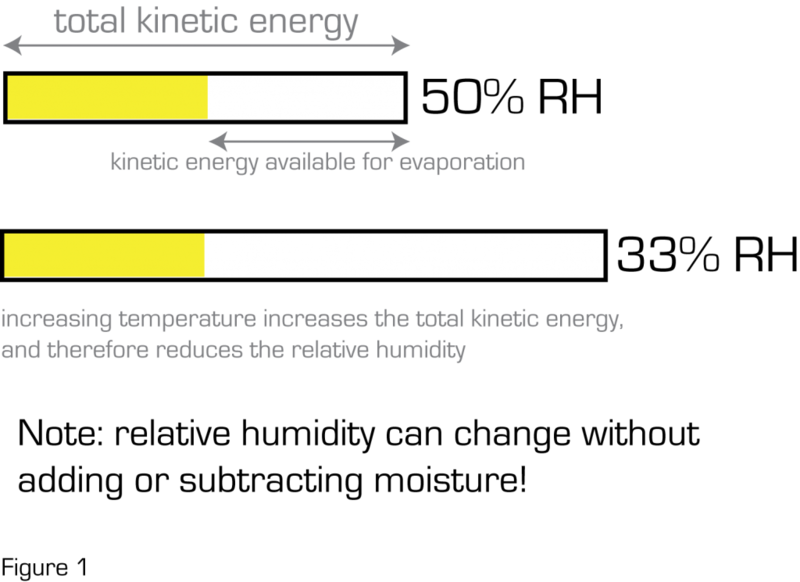 If we want to graphically represent relative humidity, we could show the kinetic energy in a system that has already been used to free water molecules compared to the total amount available (Figure 1). When we increase the temperature, we give the system an even greater capacity to free water molecules. Holding all else constant, increasing the temperature reduces the relative humidity (RH dropped from 50% to 33% in Figure 1). A key point is that the relative humidity can be changed without adding or removing moisture to the system. As an aside… People will commonly describe relative humidity by saying, “The air is holding 40% of its capacity.” I dislike this terminology because the air isn’t “holding” the water vapor. Remember water molecules are like billiard balls bouncing around a fairly open table. I’ll admit, describing relative humidity in terms of kinetic energy instead of vapor pressure is a little unorthodox. But when you boil it all down (pun intented), kinetic energy is the overarching scientific concept. Don’t believe me? Dig a little deeper into kinetic theory. Besides relative humidity, the other three variables that measure water vapor are humidity ratio, absolute humidity and specific humidity. All of these measure the mass of water vapor in the air. You don’t think of those invisible water molecules as having much mass, but they do! Humidity ratio is the mass of water vapor per mass of dry air. Common expressions include grams/kilograms and grains/pound. Specific humidity is the mass of water vapor per mass of humid air. Common expressions include grams/kilograms and grains/pound. Of the three, I personally use humidity ratio the most. Well, there you have it… A brief introduction to psychrometrics. In later posts I’ll be discussing the psychrometric chart and applying all this knowledge to conducting an indoor air quality assessment. Very nice series of explanations, Ian! It’s rare to find a discussion of psychrometrics related to structural / environmental drying interests that are not populated with faulty theories derived from industry propaganda. I would suggest that the third segment of your series about relative humidity could use a bit of work though. Relative humidity is also known as “relative vapor pressure” and in fact is derived from a calculation of vapor pressures. Essentially, when the vapor pressure over the surface of a liquid is equal to the vapor pressure of the gas above it – the relative humidity is 100%. It is called “equilibrium vapor pressure” because those two vapor pressures are equal. When the environment possesses a fraction of that “equilibrium vapor pressure” – this is calculated out to be the “relative humidity”. So for example (and for easy numbers); assume the surface of liquid water is 79F and the air above it is also 79F. The liquid water possesses a vapor pressure of darn near 1 inch of mercury pressure. When the vapor pressure of both the liquid and the air are identical – they are said to be in equilibrium. Some call this air “saturated” which is an unfortunate phrase since this vapor pressure can exist in the absence of the other gasses that make up this blend we call “air”. So – when the environmental vapor pressure is only 0.6 inches of mercury (yet still 79F) – then the relative humidity is 60%. (simple mathematics: 1 inch divided by 0.6 = 60%). Great thread though Ian. Keep up the good work. Great comments! You define relative humidity with vapor pressure and I have no arguments there. Defining it with kinetic energy is a just looking at it from a different angle. You state, “I flat out reject comments that imply the evaporation of water is a function of the air”. I agree with one proviso. Air may be the means of delivering kinetic energy to the water. Yes, it’s the kinetic energy in the water itself (mostly) that frees up the water molecules. But indirectly, the air may be the means of transferring the energy to the water. In my terminology I would say, “So long as there is enough kinetic energy, molecules will escape regardless of the gas around it.” Again, the water may ultimately be geting its heat from the sun via the air (or other heat sources, earth’s core, fuel etc.). I clarified this a bit in the post. Yes, you are correct. Again, its the kinetic energy in the air that may be delivering the kinetic energy to the water molecules. Example… sun comes out and increases the kinetic energy of the air which then increases the temperature of the swimming pool water. You’re saying the air isn’t important but without it, the additional kinetic energy would not be delivered to the pool. Great discussion! I’m sure you’ll have more to say! I am confident that you will realize the [innocent] error with your statements once I mention it. The fact is that the sun doesn’t heat “air”. The energy from the sun is delivered through the transfer of radiant energy. Radiant heat does not heat air. It warms the materials upon which it radiates… and the air in turn becomes warm due to conduction. The warmed air can then deliver thermal energy to other materials through convection. Your final comment: “You’re saying the air isn’t important but without it, the additional kinetic energy would not be delivered to the pool.” Well, with the information provided above – do you still say that the pool water cannot be given thermal energy (aka. kinetic)? The thermal energy gain of a liquid does not require the presence of air. I originally said air “may” be the means of delivering kinetic energy to the water, but then I bungled up my radiant heat! Thanks for your gracious correction and comments on heat transfer. Yes I agree that the surrounding air is not the only means to heat the water to give it enough energy to evaporate. Time for me to find some heat as a cold front is coming through Chicago! Sorry for responding so late on this thre part article you wrote back in October of 2010, however my question as it pertains to structural drying is this. Why would the ambient temperature rise in a spacef when using a LGR (low grain refrigerant) dehumidifier if the air passes of refrigerated coils to reduce the humidity? Does this have something to do with the kinetic energy being increases in the building materials as the moisture content is reduced? An LGR dehumidifier or any other mechanical dehumidifier is not too dissimilar from a residential air conditioning system. Both pass air over cold coils in order to induce condensation with the goal to remove moisture from the air. You residential air conditioning system cools the air down and removes the humidity. It cools the air down by rejecting indoor heat to the outdoors. An LGR dehumidifier only wants to remove the humidity, not cool the air down. It doesn’t reject the heat outdoors, it merely rejects it back right indoors at the unit itself. In other words, an LGR dehumidifier cools the air down to get condensation, then heats it right back up. In a perfect world, the dehumidifier wouldn’t have a heating or cooling effect on the surroundings. However, the electricity used is converted to heat and that is why they have a slight heating effect. Not a bad reply Ian. I would like to add a bit more to it if you don’t mind. Mike, whenever you run an electric appliance of ANY sort, there is a waste byproduct of running the machine in the form of heat. This extra heat can actually be quantified. You take the Amps multiplied by the Volts (equals Watts) – and then multiply that number by 3.412 to calculate how many BTU/h will be produced by the machine. This is PART of what you feel in the output air stream of the LGR dehumidifier. But there’s another source of heat that should be acknowledged. Whenever you collect water vapor out of the air (be it with condensation like a refrigerant dehumidifier – or with a desiccant dehumidifier), you have CAPTURED a water molecule that possesses a lot of energy! That energy is what KEPT it in a vapor phase! So – now that you have captured it… where does all that energy go? Well, in the case of the LGR dehumidifier, when the water molecule was condensed back into a liquid water droplet (a lower state of energy), the water molecule had to surrender its excess energy to SOMEWHERE. (You can’t destroy energy – you can only transfer it). The extra energy is given to the temperature of the airstream and is part of the reason why the air “feels” warmer on the outlet. What I have just described for you is “latent heat” transferring energy to the “sensible heat” portion of the air enthalpy during a phase change. To test this out for yourself… compare the differences in the inlet versus outlet temperatures of the dehumidifier when it is in a very humid environment versus a dry environment. The more water it condenses out of the air, the warmer the airstream exhaust shall be. Sorry for the plug here…. but, if you would really like to learn more of the SCIENCE behind restorative drying (including dehumidifier and other restorative drying tools), I would recommend this book: Leadership in Restorative Drying http://restorationleadership.com/LRD%20book.php It has a LONG pedigree of required reading among several restoration certification groups. Great comment Ken! Mike, sorry for not reading your question carefully to see you were asking about the raise in temperature when latent heat becomes sensible heat. If you were to add heat to water, not all that heat goes to increase the temperature. In fact, you can add heat to water and not raise the temperature a single degree. This happens when there is a phase change. As you add heat to a bowl of melting ice, the temperature doesn’t increase… it stays at 32°F. Where does all this heat energy go? It’s being stored up as potential energy, latent within the water molecules. The heat added to liquid water will result in two things: increasing the water’s temperature and/or causing some phase change (water molecules escaping to become a vapor). When condensation occurs (vapor coming back into the fold) the stored up, potential energy becomes kinetic energy. To use terms from high school physics class, think of temperature (sensible heat) as being related to kinetic energy and latent heat as being related to potential energy. Ken, I’m sure you’ll have another comment or two!!! Ummmm… Respectfully… I don’t know if condensation results in a change from “potential energy” to “kinetic energy”. Rather, I would say that the enthalpy (definition: the sum of both the sensible and latent energy and is usually expressed in BTH/h) remains the same. However – when condensation from a volume of air occurs, the latent energy will diminish while the sensible energy shall increase. The energy form does not change to “kinetic” (it’s still “enthalpy”), however the energy is re-disbursed among the latent and sensible components. This is the kind of stuff that makes your head explode…. sigh. When condensation occurs, latent heat changes to sensible heat. I have never seen it expressed that way – but it absolutely makes sense when you show it that way. Thank you both, This information has help to explained some ongoing questions I’ve had about temperature and structural drying.